Slayer spokeswoman Heidi Robinson-Fitzgerald said he died on Thursday morning of liver failure at a Los Angeles hospital with his wife, Kathy, by his side. The guitarist had recently begun writing songs with the band in anticipation of recording a new album later this year. He had been slowly recovering from what was believed to be a spider bite that nearly cost him his arm after he failed to seek immediate treatment. "The music industry has lost a true trailblazer, and our deepest sympathies go out to his family, his bandmates and fans around the world who mourn his untimely passing," said Neil Portnow, president of the Recording Academy, in a statement. Ms Robinson-Fitzgerald said that it is believed the spider bite contributed to the failure of Hanneman's liver, but it is unclear whether a post-mortem examination will be scheduled. "Jeff Hanneman will always be a metal god," rocker Andrew WK posted on Twitter. 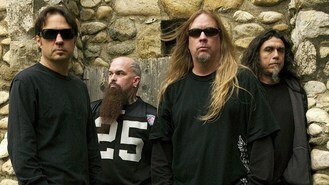 Hanneman co-founded the thrash metal pioneers in Huntington Beach, California, in 1982.